→When To Plant Winter Wheat For Deer? Want to know the best season when to plant winter wheat for deer? Are you also curious on how and why deer become attracted to winter wheat? It is one of the many sources of food for deer. Before, I didn’t see the importance of planting winter wheat because there are other options like acorns, nuts, fruits, and other plants. However, the transition from fall to winter is the time when bucks are having a difficult time bulking up calories as they prepare for the chilling season and it is the best time to take advantage of the situation and plant winter wheat! When winter wheat is planted during fall, it gets enough sun to grow until spring time which makes it a good choice since it can be there for a while and deer can easily access it. Plus, it takes less time to prepare your soil – it will only involve a small amount of sun and plowing before it gets ready to be devoured by deer. Winter wheat is attractive because it contains high protein and can easily be digested. It is also known to be a preferred food of whitetail. It also has seed heads which can also contain an abundant source of energy. It is important to choose the right spot on where you will plant your winter wheat. According to Off the Grid News, there are nine factors you should consider which are humidity and drainage, texture, sufficient fertility, adequate sunlight, shape, size and ease of access. All the plots should have an uneven shape (at least 1 acre) and a quarter mile apart. If your soil does not offer such, you may opt to find other spots like logging roads and fire lanes. But be careful on planting near highways because it might cause your deer to be run over by cars. Also, if you decide to plant early, it might promote excessive growth when winter comes - resulting to winter injury. Even with these risks, it is still recommended to seed early as opposed to seeding late. But you can also plant past the optimal date as some growers still produce profitable yields. During fall, there is a shortage of moisture in the soil. As a solution, you can plant your crops 1 to 1.5 inches deep so that when the rain comes they can easily absorb it and still thrive and grow. Keep in mind the ideal soil pH is between 5.5 to 6.5 while you are planning when to plant winter wheat for deer. Chances of your winter wheat being planted is dependent on the kind of soil you have and with the right conditions you can yield better. Do not plant in soils with 3.5 pH and those that go beyond 10 to get the best out of your productivity. There are cheap soil kits in stores to know the pH of your soil, so no need to worry about its availability. The recommended seeding rate for winter wheat is 25 to 30 lbs. per acre. Also, knowing the soil pH can help you develop strong crown tissue and strong roots. In time this can back you up during a winter season. 23 to 25 plants/ft2 is equal to 900,000 – 1,000,000 plants/acre – the suggested rate for seeds. Why should you compute it? When you calculate, you can identify whether you are already way past the optimum window. 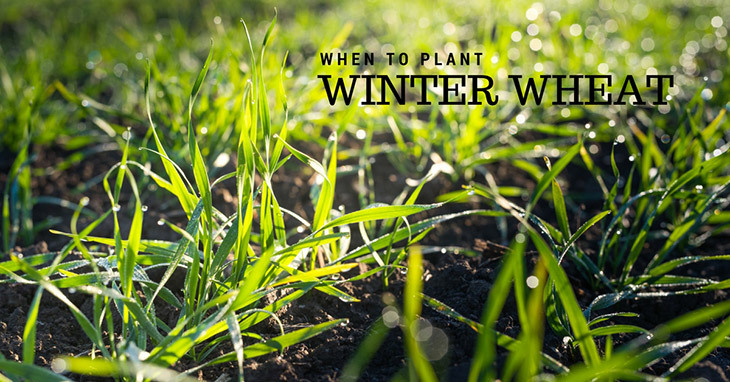 It is better to have just the right amount since planting beyond the recommended rate will equal to a higher percentage of your plants being killed during the winter. Again, I repeat, there is NO advantage if you seed more than the optimum rate. Joe Lacefield, a wildlife biologist for Kentucky Department of Fish and Wildlife Resources said that he recommends embedding clover and wheat at the same time. As the clover continues to grow during the winter, it will arise on spring just as winter wheat begins to wither. It should be considered as one of your priority because it might cause for your plants to die. The green bridge is a host for pathogens and they make way for these pathogens to affect your crop. They move with the help of wind. You might not easily identify it but your crops can suddenly die because of this. You can prevent them from killing your crop through planting other crops or weeds two weeks ahead of your desired date to plant winter wheat. Two weeks is sufficient time to check if there are host present. If not, you are assured that they will not be affecting your plants. Since winter wheat will lay in the soil for an extended period of time or if there your crop has a disease developing, you can apply fungicide to protect it. Meanwhile, you can use an insecticide to battle wireworms if they are present. As mentioned, when to plant winter wheat for deer is recommended to be during the fall season. The soil, proximity of the crop with the food spots of deer, the size of the land, available waterway or source of water near the area, avoiding green bridge to happen, treating the soil with fungicide or insecticide – are a great influence on the quality of winter wheat you are going to yield. Since this is not created by nature itself, the crop can only be an attractant when it has the same quality on what is available in the area. If you follow this, there is no such thing as “October Lull” because a food is the best strategy to get the bucks coming out in your area.